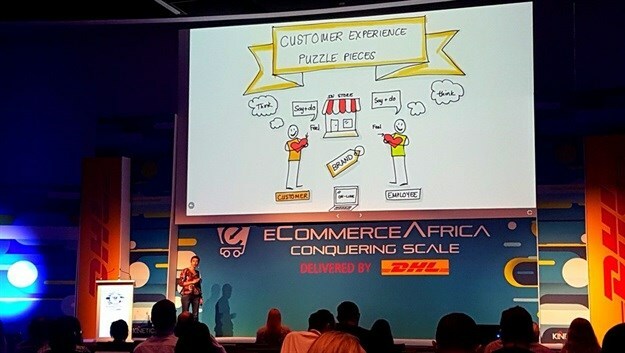 The 5th eCommerce Africa conference kicked off at the CTICC on 19 March 2019 with a keynote session by Chantel Botha, founder of BrandLove, in the customer experience track, titled: 'More than a feeling, on why CX is the #1 competitive differentiator'. Here's what you missed! With the day's moderator Dylan Piatti having introducing her as 'the love doctor for brands,' Botha shared that she started in working in the ecommerce world in 1999 and never thought she would one day open a conference talking about feelings. Fast-forward two decades and that's exactly what happened. Through an online poll, Botha asked conference attendees a number of questions, with the results updated in real-time, on what they purchase most often and their biggest 'online experience' challenges tops were payments and delivery times, which often lead to huge amounts of frustration - unfortunate for a process typically built to delight. That makes sense when contrasted against typical traditional retail as digital journeys are messy, which means they’re emotional. Research shows that people buy online while they're at work, while they're driving and when they're on the toilet - probably not how you picture them at that stage of the customer journey. Botha took attendees on a similar emotional rollercoaster because while so much has been spoken about customer experience and its importance in building a customer-centric business in the modern customer space, with so many hard elements pulling for resources, it's critical to place what seems like a soft discipline at the core of your business. Simply put, if your customer gaze is purely from a product perspective, you're missing crucial opportunities to interact with your consumers when they experience the highs and lows of emotion along the way. That's why Botha says to design customer journeys based first on customer needs, then to focus on their specific story, goals and feelings - only then can you use those learnings to differentiate with meaning. It's incorporating that outlook into your brand essence that'll help define your customer experiences. While offering an experience through the traditional bricks-and-mortar retail journey is relatively easy to explain, it's a more internal process for the online experience as those tend to be driven by emotion. When all goes well the customer saves time in simply logging in wherever they are rather than driving to the store, has an easy return and comparison process, and there's a level of privacy as you can choose to make your purchases anonymously and steer clear from crowds. Emotion drives most of this process. The downside is what Botha touched on in her earlier audience poll - the absence of sensory experience and human contact, the heavy shipping costs, unforeseen delays if the product is out of stock, often excessive packaging, as well as the risk of fraud and uncertainty of what you're really getting if it's a new product or service. Unfortunately, it takes a lot more to impress customers and less to disappoint them today, as expectations and needs have changed drastically over the past few years, with few brands making the effort to keep up with the trend. Customers will shift loyalty fast if your brand disappoints. Remember that in customer journeys, it's important to also map the moments you have no control over as a brand, like the customer experience in the parking lot of the mall where your store is based. A bad experience micro-moment there forms part of the customer's overall experience with your brand. Botha said we know to design for delight but also design for what to do when there is disappointment, because those moments will happen. Design those moments and memories to get your customer to fall in love with your brand again, and watch the #ecommerceconfex hashtag for updates throughout the eCommerce Africa 2019 conference.